Mad Men. Don Spector didn’t just watch them on television. He was one of them. 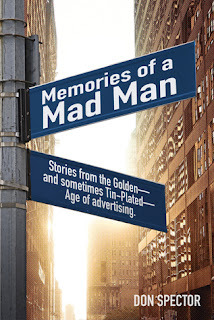 Starting in a Madison Avenue ad agency in the ‘60’s, he actually lived the life captured in the TV show. In "Memories of a Mad Man" he shares with us an unforgettable era filled with humor, brilliance, wonderful heroes and big, bad villains. The funny and fascinating stories he tells uncover the reality of the ad world behind the show. • What's the real truth about truth in advertising? The book answers these and many more intriguing questions in this unique look into a unique profession. 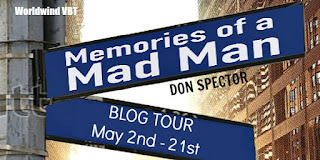 Starting as a junior copywriter in a Madison Avenue ad agency in the '60s, Don Spector qualifies as a genuine Mad Man. Creating advertising for the agency's high-profile accounts like Smirnoff Vodka and Tareyton cigarettes, he began his ascent up the creative ladder in several New York agencies. His commercials and print ads for advertisers like Xerox, the Yellow Pages and Jaguar ultimately led to an offer of a key position in Los Angeles-based BBDO/West where he was soon named Creative Director. After moving to a similar position at Foote Cone Belding/Los Angeles, he eventually started his own agency where he served until his retirement. The advertising he created for dozens of companies like ARCO, Absolute Vodka, Bristol-Myers and S.C. Johnson won numerous awards. But, more importantly, it generated millions of dollars in sales for them.